Charge your Gear Sport seamlessly with the wireless charging dock. Running low on battery? 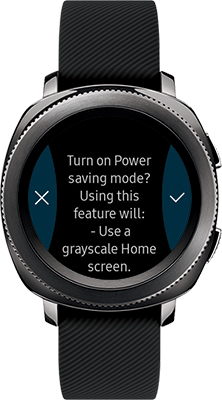 Activating power saving mode will help your Gear Sport last longer between charges. If power saving mode is too limiting, try changing some display settings. Screens and settings available may vary by wireless service provider and software version. Don't let wires hold you back. 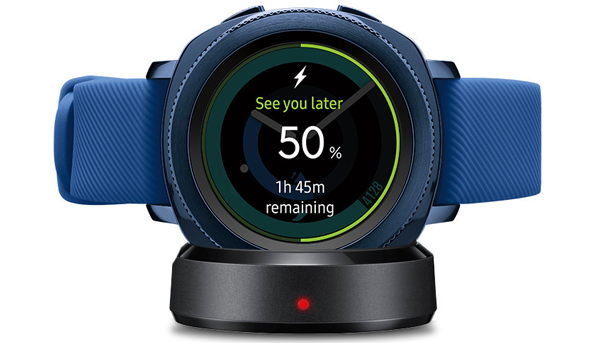 The Gear Sport comes with a wireless charging dock, built for on-the-go people like you. Just place your Gear on the dock and it will magnetically snap into place and the screen will orient itself. Want to save power? Activate Power Saving Mode to turn off certain features, like notifications and Wi-Fi, to make sure your battery lasts and lasts. 5 Touch the Check icon to confirm Power saving mode. 6 To deactivate Power saving mode, touch OFF, and then touch the Check icon. Gear IconX: How do I reset the earbuds (SM-R140)?